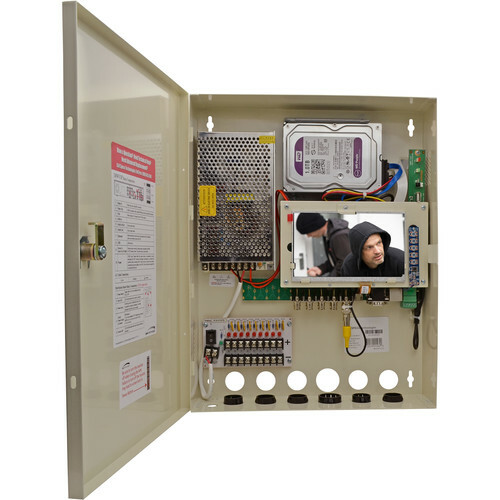 The 4TB 4-Channel Wall Mount DVR with Built-in Power Supply and Monitor from Speco Technologies has 2-way audio communication and an easy and simple graphical user interface. It features remote monitoring, recording, playback, configuration, software upgrades, and PTZ control via Internet. With either Event Recording (Motion) or Alarm In activated in your Speco DVR, the integrated Digital Deterrent feature can generate both Light and Sound warning indicators. This easily mountable unit can be installed in equipment closets or electrical rooms for covert monitoring.